Fintech is the practice of applying technology to finance, and it is a major driving force globally. Investors poured in $1.8 billion in 2010, and this figure jumped to $19 billion in 2015, finally reaching $15 billion with another 3 months to go for year 2016. 2017 is also shaping out to be an exciting year for fintech innovation in Asia. For this article, we will be focusing on Singapore-based fintech companies that will make a difference in your life. Let’s begin with a logical flow. You are both a worker and consumer. When you manage your finances well, you will have savings. Then, you are in a position to either invest in traditional equities or the more exciting private equity. Here, we look at how fintech companies are going to help us to do it better and easier. We will begin our journey with managing our personal finances with Seedly. Seedly was co-founded by CEO Kenneth Lou and CTO Chew Tee Ming in January 2016. 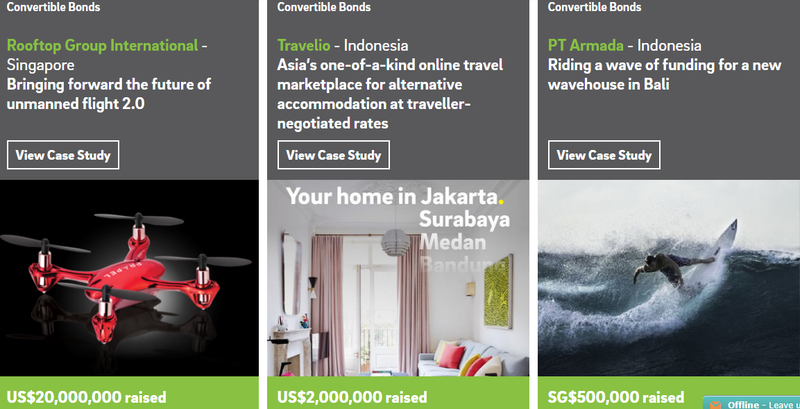 Kenneth had just failed in his previous Kickstarter campaign but he rose from the ashes with backing from Indonesia’s East Ventures and Singapore’s NUS Enterprise. One of the obstacles to unravel the mystery of your finances would be the fragmented nature of your finances. Seedly shines as an aggregator that makes it easy for you to budget and track your expenses. First, they allow you to aggregate your banks, credit card and daily expenses. Then they break down the expenses category for you in charts so you will know where your money went to. The best part is that they provide insights to your spending patterns. 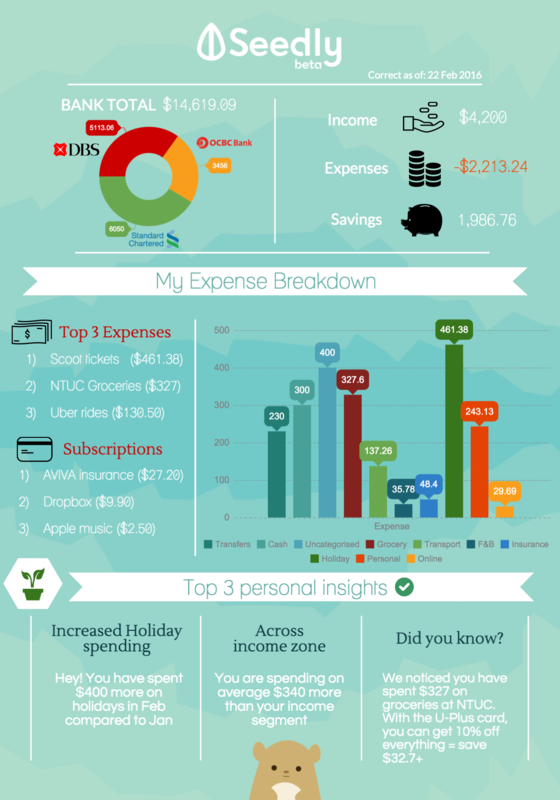 As their infographics shows, they can even suggest ways for you to get discounts from your routine spending. Seedly is a free personal finance app and they would be monetising it through merchant tie-ups. Once you know where you are spending your money, it makes it possible for you to cut your spending without affecting your quality of life. Now we assume that you had managed your budget well with Seedly and you have saved up a cool $10,000 for investments. As a young investor, you might be more conservative in your initial investment. You might want to opt for the security of established blue chip stock on the Singapore Exchange or even the New York Stock Exchange. Since you are a working adult, one of the last thing that you want to do is to monitor your holdings daily. It distracts you from your work and puts you at risk of losing your job. That is when Call Levels come into play. it allows you to set a critical price level, which you would be alerted for on your phone. Their apps are for both Apple and Android phones and this is not just limited to the stock market. They have alerts for forex and commodities markets which you can broadcast to those who are in your group as well. Call Levels was founded in September 2014 by co-founders Daniel Chia and Cynthia Siantar. Daniel was an ex-hedge fund manager who realised the importance of price monitoring and Cynthia came from a consulting background. Call Levels tracks over 10,000 financial assets and allows you to track up to the first 5 assets for free, and these can broadcasted to 10 other people. Beyond that, you will have to pay $4.99/month for their services – a small price to pay for an invaluable service. The opposite of a public exchange would be a private exchange. So what’s so attractive about a private exchange? Well, let’s first look at public companies. If you are public company, you are obliged to release your financial results every quarter. This is a strain on resources as management is under stress to provide positive results each time. This induces short term behaviour to boost earnings that can sometimes come at the expense of long term earnings. Look at how SMRT was privatised when it had to concentrate on solving its operational issues. A lot of startups who are pursuing breakthrough technologies such as drones don’t have the luxury of time for quarterly reporting or the track records to be listed in the first place. In other words, what you are missing out on multi-baggers opportunities. The listings on SGX represent a tiny fraction of investment opportunities. There are a lot of hidden gems that are privately held that you are not aware of until it has matured. Fundnel co-founder Kelvin Lee wants to create a private exchange in Singapore by 2020. One example of private exchange would be the Nasdaq Private Markets which grew by 136% last year. In the meanwhile, you can invest into startups through Fundnel itself. Fundnel would sieve through promising companies and provide you with all the relevant information needed for your decision. Individual investors usually do not have the resources to do the proper due diligence and settlement on their own. Both are time consuming and require specialised knowledge. These information and deals are also previously the exclusive domain of institutional or high net worth individuals. For the companies, they can reduce their fund-raising from 6 months to 3 months and better gauge investor’s interest. Fundnel also takes care of the sensitive paperwork for the companies. After all, startups prefer not to hire another person to handle the financial paperwork if they don’t have to. All in all, Fundnel is an equity marketplace which provides a win-win solution for both sides. Since its inception in 2015, Fundnel had helped 15 companies to raise $49 million. The catch is that you take on considerable risk when you invest in a startup as it’s known that 90% of startups fail. Fundnel tries to curate the winning 10%, but the risks still remain, so invest wisely! If you want to build your wealth, you must first stabilise your base and this is a timeless wisdom. Seedly is the new age fintech tool that can help you do that. Once your capital is ready, you can either choose to invest in the traditional asset classes with Call Levels or the startups with Fundnel. 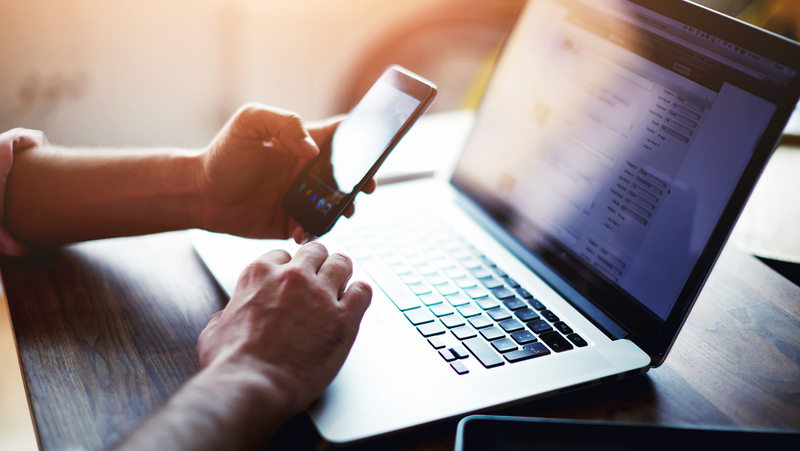 In today’s digital era, it’s high time to use these fintech tools to your advantage.